A wedding will certainly represent one of the most important days of your life. In order to ensure that no unexpected surprises come to pass during this special event, it is wise to plan ahead. There is perhaps no more important consideration than what you and your guests will be eating. Determining the best entrees for a wedding reception can be slightly tricky, as this will partially revolve around your budget as well as the tastes of the attendees themselves. Let us look at a handful of universally appealing suggestions before moving on to examine some factors to take into account when selecting the best meal for your wedding. Vegetarian options with a couscous salad side. Filet mignon with a side of green beans or spinach. Fish platters such as cod or salmon. The most important factor is to ensure that your guests have the ability to choose between different dishes. This will help to ensure that all needs are met and that they keep coming back for seconds. One of the most pronounced trends in recent years involves guests being able to proactively choose their meals through the help of an interactive food station. While these areas are still managed by professional catering staff, attendees can select which items are the most appropriate for their tastes. This is also a great way to encourage mingling during the reception. They can still sit down and enjoy a meal while knowing that they are able to control other variables such as portion sizes and side dishes. 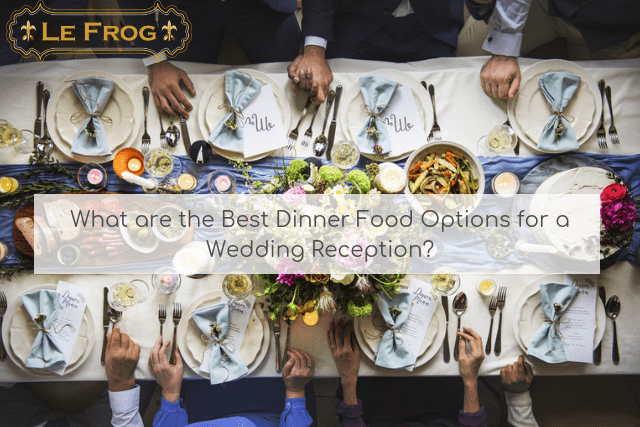 Of course, these are only a handful of the most basic guidelines to consider when choosing the best food options for your reception. The good news is that the experts at Le Frog Caterers possess the ability to satisfy even the most discriminating of tastes. Thanks to over two decades of experience in the industry, you can rest assured that our chefs and attendants aim to please. Do not hesitate to contact one of our representatives at your convenience to learn more about what we have to offer.